About Food With a Dollop of Humor! 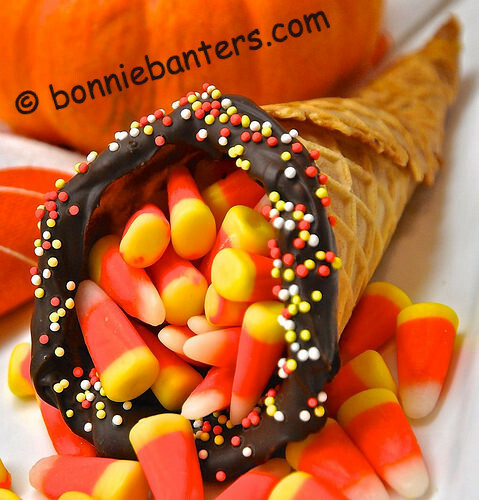 Easy and whimsical, you'll have so much fun with this scrumptious cone as a favor for your guests or as a gift for the host of your Thanksgiving gathering! Also, everyone would think you are so clever if you elect to use these festive cones as props for your holiday place card settings. Incredibly versatile, these cute cones can be filled with any number of candies or goodies (of course, ice cream!) and sprinkled with a variety of colored nonpareils for different holidays. Just Look In My Recipe File! Cell Phone Deals At Amazon! LET'S GO SHOPPING ON AMAZON! Thank you Jill from Dulce Dough! Bonnie Banters is a participant in the Amazon Services LLC Associates Program, an affiliate advertising program designed to provide a means for sites to earn advertising fees by advertising and linking to amazon.com. This site may also contain other affiliate links. If you click one of those links and purchase a product, I may earn a small commission. Notice Regarding Online Behavioral Advertising: We allow third party companies to serve ads and/or collect certain anonymous information when you visit this site. These companies may use non-personally identifiable information (e.g. click stream information, browser type, time and date, subject of advertisements clicked or scrolled over) during your visits to this and other Web sites in order to provide advertisements about goods and services likely to be of greater interest to you. These companies typically use a cookie or third party web beacon to collect this information. To learn more about this behavioral advertising practice visit the NAI at http://www.networkadvertising.org. To opt-out of this type of advertising, you can visit http://www.aboutads.info/choices. ©2019 Bonnie Banters™. All rights reserved.. Awesome Inc. theme. Theme images by claylib. Powered by Blogger.